American democracy. The oft-repeated phrase rolls off the tongue perhaps a little too easily, according to at least one American academic. Lawrence Lessig, a renowned professor at Harvard University‘s Law School, tackled the issue at an event sponsored last November (2014) by Quartz, an online magazine operated by The Atlantic family of publications. In the last few weeks, Lessig’s comments have begun circulating again on social media, in which he argues that the United States is no more democratic than say, Hong Kong, or even Iran, because of the way that U.S. elections campaigns are currently controlled by ‘early-stage’ funders. Most political science students have probably heard the argument before: America is not actually a democracy, but rather, a republic. While the “republic” argument is often referenced by socially conservative or libertarian Americans, Lessig’s argument seems to go even farther, arguing that even according to historical American political processes, modern presidential campaigns in the U.S. have now been corrupted to the point of representing only a small sliver of wealthy ‘donor’ elites. 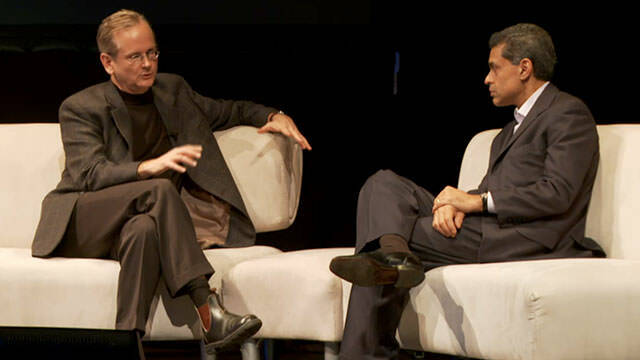 After Lessig made his case, he briefly spoke with CNN’s Fareed Zakaria. Lessig, who is also a political activist, has fought for campaign reform in the U.S. for several years, and has also been a key member of organizations such as Creative Commons and the Electronic Frontier Foundation. He was also a professor at Stanford University’s Law School, and has been involved in several notable legal cases.